Monty set his alarm for 5:15 AM and it actually woke him up. I’m sure it wouldn’t have woke me, but Monty did. During breakfast, Jammie asked me if I wanted to hunt without dogs. I accepted his offer to moderate our dog use in order to increase the chance that I might have a chance to spot a pig and shoot it at a distance without dogs. Not that dogs are a bad thing, but I explained to Jammie (as diplomatically as I could) that I’d rather shoot my animal in a peaceful setting if possible. A nice two hundred yard shot at a standing boar would be ideal. We tied the dogs in the back of the Ranger so they couldn’t get out and chase. Then we drove the ridge tops for about an hour with no success. It’s hard to say just how far away a pig may be when a dog smells it. The wind direction and speed, the speed of the vehicle and the topography must all come into play. When the dogs started clawing the bed of the truck and otherwise showing their urge to chase, it wasn’t clear where a pig might be. Looking back upon that moment, maybe we could have figured something out if we stopped the truck and checked the wind direction. And, away they went. We weren’t far behind, attempting to follow in the Ranger. It wasn’t long before we found them raising a ruckus a few hundred yards up a draw. When we reached the dogs, they had a boar in an ideal situation. The pig was surrounded in the open at the bottom of a narrow draw. The boar was so preoccupied with the dogs that it probably didn’t notice our presence. Jammie told me to get ready and he’d let me know when it was clear to shoot. The last thing we’d want to do was hit one of his dogs. When he gave me the OK to shoot, a bullet was immediately sent into the pigs vitals. But it didn’t go down immediately. Although the pig was probably dead on its feet, a second shot definitely finished it off. The pig was a boar of about 200 pounds. It had a good set of choppers and a couple open wounds – signs that it had been fighting recently – apparently in competition for the rights to breeding a sow. Here I am with the boar. This was my first-ever mature boar killed with rifle and also my first ever pig killed with the use hounds. I’ve killed a couple of pigs with bow and arrow and also a couple of pigs on Catalina Island with my rifle. I guided hunters for several years, but left the shooting to them. The hounds made the hunt exiting and got my adrenaline going, but I doubt I’ll hunt this way again. If they were my dogs, it would be different because the dogs would be more personal part of my participation. I can understand why houndsmen enjoy training their dogs and are enthusiastic about the chase. Hound dogs are very attractive animals with a great temperament. The dogs love the hunt and thrive on the chase. They charge the pigs and face danger each time they come within reach of the boar’s teeth. I particularly liked the way they laid back on the grass and stretched while relaxing once the hunt was over. Their post-hunt regimen stood in sharp contract to the attitude they displayed during the melee associated with the catch and was consistent with the attractive qualities of other hunting dogs I’ve known. I’m glad I didn’t deprive them of the opportunity to do what they live for. Over a year ago, Red Bank Outfitters donated a hunt to the Mule Deer Foundation and we were lucky enough to auction it at our Livermore banquet. 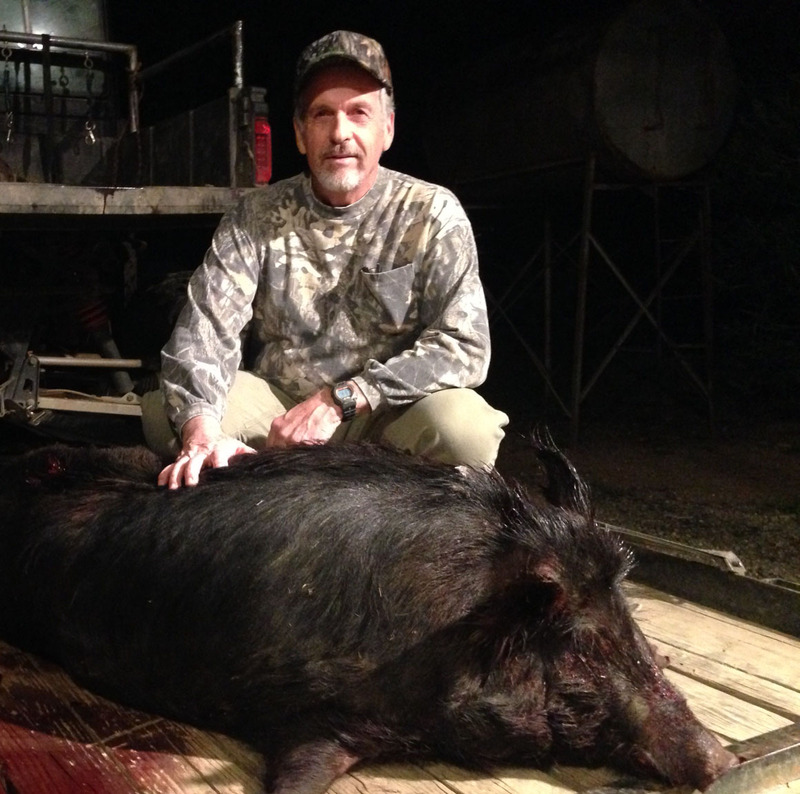 Knowing that my grammar and high school buddy, Monty Morton, was looking to hunt pigs, I purchased the hunt and let him know that it was waiting for his arrival. A few months ago, we set up a hunt for March 18th and I purchased an additional hunt so we could both join in the fun. Red Bank Outfitters, which occupy the ranch once called Red Bank Quail and Ale, have thousands of acres available for pig hunting. In addition they have a lodge, trap range, quail, chukar, pheasant, turkey and deer hunting. They also have ponds full of bass for those who are inclined to fish. Monty and I were focused on only pigs and, as is often the case when entering new territory, we were eager to learn the ground rules for the hunt. We used the do as the Romans do approach. We were not surprised when I was told that I couldn’t use my archery equipment, as it might endanger the dogs. That dogs would be used wasn’t a complete surprise, but the absolute nature of dog use was. With the poison oak fully leafed out in the deep ravines and oak covered hills, it would be next to impossible to spot a pig and even more difficult to get a shot at one in the thick cover – that is, unless we used dogs to root them out. Having been to a few of these rodeos, I knew that our hosts would be eager for us to pull the trigger and seal the deal. I hadn’t realized it before the hunt, but these hunts are guaranteed, not something one would do without complete confidence in their ability to roust pigs and bay them up within shooting range. We arrived on Tuesday afternoon and by 5:30 PM we were hunting. Our guides, Jammie and Bo, were quite accommodating and professional. Bo drove the four seater ATV while Jammie provided the dogs and dog handling. We covered ground over the short but steep hills west of Red Bluff. As Jammie watched his dogs for a sign they had pig scent, Bo drove the ATV so close to the steep side-hills that I nearly bent the frame of the Ranger with my grip while holding on. Not long after Jammie took the dogs for a hike through some likely territory, we came upon a boar of about 200 pounds, but couldn’t get a shot off as he passed through the poison oak below us. 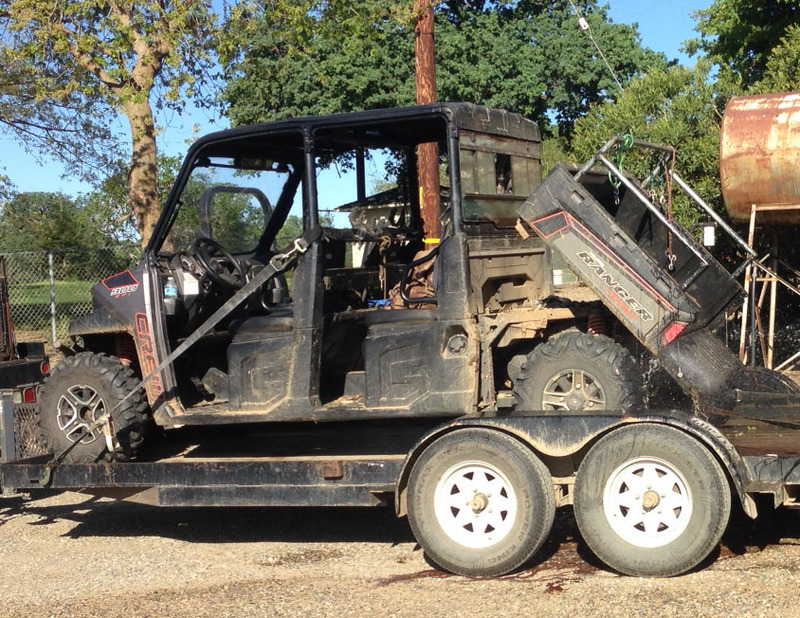 This Ranger was able to go just about anywhere – an impressive piece of equipment. As we waited for the boar to reappear, the dogs began to bark from an adjacent canyon. Off we went to find out what they had caught. In the bottom of that draw, the dogs had a pig circled in a poison oak patch. Since this was Monty’s show, he and Bo dropped into the canyon ready to shoot. The sound of the ongoing dog and pig fight was hellacious. A few minutes passed before Monty had an open shot, but when he got his chance, he didn’t miss. However the pig was not done after one shot. 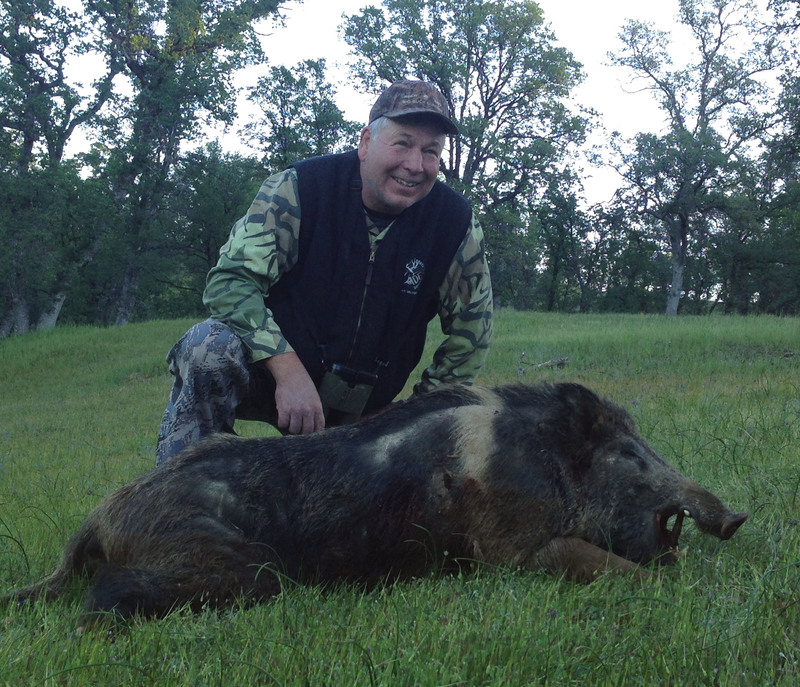 With dogs circling and charging the pig, adrenaline was pumping in all of us as Monty finally finished off the 260 pound sow with some help from Bo along the way. With all the fighting and shooting and after dragging it out of the steep draw, the sow was quite a sight. A bit worse for wear, here she is on the back of the trailer at the skinning shed. Monty got his pig. This sow had pretty good sized tusks. At 260 pounds, the pig had a lot of good meat for Monty to take back to Idaho. With the sow hanging in the cooler by 9:30 PM or so, we headed back to our home (for the night) to barbecue some rib-eye steaks provided for us by the Red Bank. The accommodations were quite comfortable, but we didn’t get much sleep before the alarm went off at 5:15 AM and we began preparations for my chance to hunt. 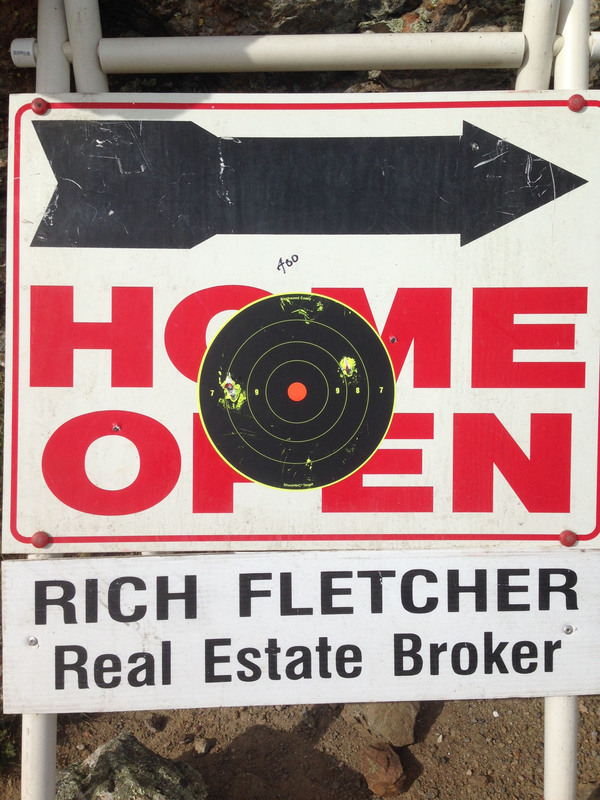 I’ve been retired for ten months and I finally found a perfect use for my old real estate open house signs. Not bad shooting for 400 yards in a 25 mph cross wind. Too bad I couldn’t do it last deer season.